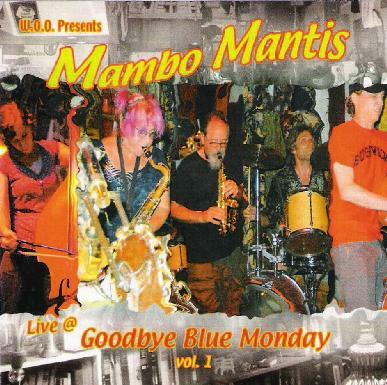 Mambo Mantis - "Live @ Goodbye Blue Monday Vol. 1"
The Woo world is a magical place for adventurous jazz fans. For me it began several years ago with the discovery of W.O.O. Revelator, the punked out free-jazz trio (with Bonnie and Ray from Mambo Mantis) that were so completely out there that they made the lineup at one of the Strange Daze Space Rock festivals. And they went over so well that another of Bonnie's bands from the Woo universe, the psychedelic jazz ensemble World of Tomorrow, appeared at two subsequent Strange Daze fests. Oh, and while we're talking about space rock… Blaise Siwula's saxophone added fire to Alien Planetscapes' great Life on Earth CD. But aside from that, Blaise is active on the New York City experimental music scene, which is clear from the frequent notices I receive of all the great shows that locals have the opportunity to attend. And here we have Mambo Mantis with their second CD. On Live @ Blue Monday the band consists of Bonnie Kane on sax, flute and electronics, Ray Sage on drums, Blaise Siwula on sax, and guests Jordan Schranz on bass and Shayna Dulberger on bass. "Quick Glance" opens the set and is the longest track on the CD. It begins with a flute and sax duet, backed by steady paced drumming and standup bass. Very hip and free-wheeling with a beatniks coffeehouse groove and out-there Sun Ra styled exploratory vibe. Blaise really takes off on sax while Bonnie's flute provides a dreamier counterpoint to the more aggressive sax. But eventually she busts out of that mode and it's dueling saxophones!! Another hightlight is Perhaps a Second Mind", which is a total free-jazz freakout jam tune with saxphones a-blazin! As jazz goes this is ROCKIN' stuff. I love it. When I popped the CD in I was surprised to see most of the tracks in the relatively short 2-3 minute range, but they all work beautifully as mini statements. This is music that typically needs time and space to develop and explore. And while Mambo Mantis certainly do that, they also succeed in tightening things up neatly and speaking their piece in short order. Some of the most high energy and exciting music features the interplay between Bonnie and Blaise's saxophones, propelled by Ray's drumming, which can be wildly frantic, but also varied and controlled. But there's also the cool grooving tunes that make me want to fire one up and dust off the Kerouac books. In summary, if you dig let-yer-hair-down tripped out scream as loud as you can and be happy about it free-jazz, Mambo Mantis is for you. It's not a non-stop roller coaster ride. There's lots of variety and the creative improvisational juices are flowing throughout. Put it on and groooooove along. For more information you can visit the Wooweb web site at: http://www.wooweb.com. Hear Mambo Mantis at the Myspace page: http://www.myspace.com/woomambomantis.